A moose on the loose near a local airport made the news.Surely there would be no more Canadian way to die than to hit a moose on the runway with your airplane. Moose continue to be a major news item.In Calgary, Alberta, they like to use public transit. Hat tips to F. R. and J. E. . If you’re hoping to become a demagogue — that is, one who “seeks support by appealing to popular desires and prejudices rather than by using rational argument”, this article should be essential reading. Let’s ignore for the moment the implied sneer in his choice of “daring”; we’ll come back to it later. “Not clear” what they were doing? Only if you haven’t been paying any attention at all. The recent origin of these protests is, as everybody knows, Colin Kaepernick’s 2016 refusal to stand for the national anthem. His motivations are clear, because he has discussed them on several occasions: it is to protest wrongdoing and very real police misconduct against blacks and other minorities. How does Prof. Guelzo not know this? In September of this year, a full year after Kaepernick began his protests, President Trump decided to weigh in, advocating that those who protested should be fired. After Trump’s remarks, many more players joined the protests. Their reasons have been discussed at length: many players felt that they had to stand up for their 1st amendment rights in the face of a government official — Trump — trying to prevent them from exercising them. In doing so, Trump was possibly in violation of 18 U.S. Code § 227 (a). How does Prof. Guelzo not know this? It’s been discussed in dozens of articles and interviews. In my opinion, Prof. Guelzo, who is no fool, probably knows quite well why the players are protesting. But to explore these reasons seriously would detract from his demagogic goal. You might think a US history professor would applaud players who engage in peaceful protests. You might think a man posting on a site about “American Greatness” could use this to tell us about our 1st amendment rights and why they are vital to American democracy. You might think a professor who wrote a biography of Lincoln would express some concern about a President who uses his bully pulpit to attack protesters and try to get them fired from their jobs. You would, sadly, be wrong. Intead, Prof. Guelzo attacks the protesters. He claims they “generat[ed] the comprehensive fury of the American public”. But my examination of coverage of the protests shows that the “fury” was far from “comprehensive”; it was decidedly mixed. This is backed up by examining polls that came out last year, after Kaepernick started his protests. For example, in one poll, “70 percent of whites disagreed with Kaepernick’s stance, while only 40 percent of racial minorities disagreed with the 49ers quarterback.” This is hardly “comprehensive”. Back to Prof. Guelzo’s sneer about “daring”. Yes, it was daring. It was daring because some players stand to lose their very profitable jobs, especially if owners take President Trump’s advice. Colin Kaepernick himself still does not have a position, despite his evident talent. It was daring because far-right demagogues are whipping up anger against the protesters, and who knows where that could lead? We know what happened when they similarly whipped up anger during Pizzagate. The players certainly are risking a lot more than Prof. Guelzo did by writing his column. Prof. Guelzo claims that the protesters don’t have the moral high ground because so many NFL players are criminals. This is the ad hominem fallacy. I could reply, I suppose, by citing Wyndham Lathem and Amy Bishop as evidence that we shouldn’t give much moral high ground to professors, either, but wouldn’t that be just adopting Prof. Guelzo’s slimy tactics? Hey, I’m not going to defend the misbehavior of professional football players, but does it really have much of a bearing on the protests and their motivations? Whether you’re an upstanding citizen or a criminal, you can recognize racism and injustice. Whether you’re an upstanding citizen or a criminal, you can support the Constitution. Edward Lawson was a black man who was repeatedly and unfairly treated by the police, even convicted once for nothing. He went to the Supreme Court to argue his case. He won. You’d think Prof. Guelzo would recognize this. Prof. Guelzo sneers at the “millionaires of the NFL” who “think they’re better or wiser” than a Civil War hero. He offers no evidence at all that these “millionaires” have ever said any such thing, nor that their protests imply such a thing. He does not mention that Kaepernick has a charitable foundation that has given hundreds of thousands of dollars to groups that help the poor and downtrodden. You’d think this would rate a mention in Prof. Guelzo’s screed. You’d be wrong. Because that’s not the way a demagogue works. 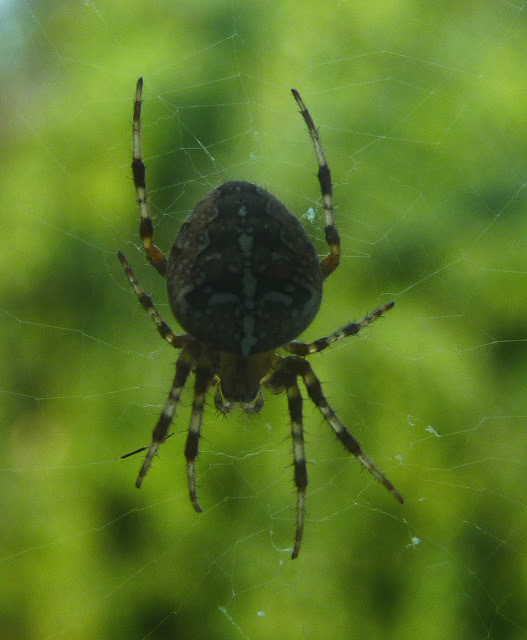 I don’t claim to be an entomologist, but I am pretty sure this is Araneus diadematus, the Cross Orbweaver. It’s not native to Canada, but common in Ontario gardens. Are Religious Beliefs Really Off Limits for Voters? Consider this letter from the President of Princeton University, Christopher Eisgruber. I am not persuaded at all by these arguments. I wrote the following response. I could not disagree more strongly with the sentiments expressed in your letter to the Judiciary Committee. 2. Beliefs do not magically become off limits to questioning, probing, or otherwise investigating simply because one labels them “religious”. As you know, there is significant debate about whether some belief systems, such as Scientology, are indeed religions. There is no bright line separating religion from other kinds of opinions one may hold. 3. It is absurd to claim that Professor Barrett’s religious beliefs are not part of her judicial philosophy, when you yourself cite an article of hers that addresses precisely this issue. 4. You also should know that the “religious test” clause in the Constitution was in response to legislation, such as the Test Acts, that made it impossible for members of certain religions to hold public office. This Constitutional clause says nothing at all about whether voters may make up their minds based on a candidate’s religious beliefs. Nor does it say that Judiciary Committee members may not evaluate the suitability of a candidate based on what he or she believes. This kind of posturing is unworthy of you and unworthy of Princeton. In addition, I note that polls show that a large percentage of the American public would not vote for an atheist candidate. Why is it that this never merits letters of concern by people like President Eisgruber? Many religious people want a double standard: the freedom to hold beliefs, no matter how pernicious or unsupported, and the right to never be questioned on those beliefs. I guess he must be just too busy to answer. Too busy writing extremely important articles like this one, for example, which is the only article published so far this year in the intelligent design vanity journal, Bio-Complexity. A journal, by the way, for which the illustrious Robert J. Marks II is also the Editor in Chief! The intensive peer review that article must have undergone is rather mind-boggling. I wonder how many times he sent it back to himself for revision. Apparently it’s hard to recruit border agents at remote US borders. 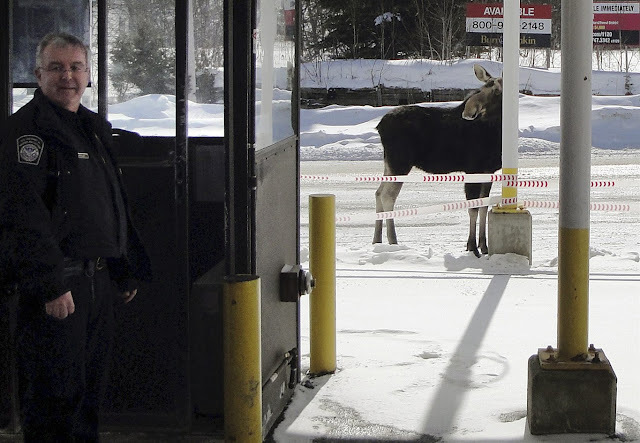 It seems to me the moose would be a major attraction. From readers JPA and RM comes the story of this rare white moose in Sweden. Moose are sensible creatures. I suspect that white moose do not believe they are superior to brown ones.